The Pub has happy hour everyday of the week from 11am til 6:30pm. Win a free Jersey during Sunday afternoon Bronco games! One raffle ticket for every purchased drink. The Pub provides free WiFi. Watch all the NFL& MLB games here! Please link to facebook at the top of the page to view pictures. 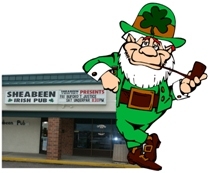 ©Copyright 2012 Sheabeen Irish Pub - All rights reserved.